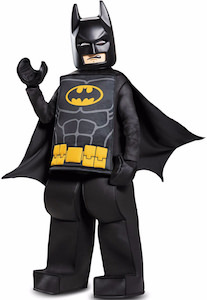 This is a LEGO Batman costume for kids that love LEGO and Batman and yes he is the same Batman from the LEGO Batman movie. The kid’s costume comes in many sizes and will transform your child into a true LEGO figure that is Batman. The costume really makes you child look like a giant LEGO character complete with the strange head and hands and it is Batman so the cape is there too. Included in the costume are Minifigure tunic with detachable cape, Minifigure pants, mask and pair of hands. And yes the costume looks square and bulky but is still pretty easy to walk in. Cosplay or Halloween this LEGO Batman costume is going to be the kid’s favorite costume of the year.